Thus Pirkko Nukari found herself a new model which she later immortalized in bronze. The sculpture is now in an art gallery in Northern Europe. But the great crested grebe still lives in her garden, being no longer able to adapt to life in the wild. Wildlife, especially the world of birds, has been the starting point and source of inspiration for the art of Pirkko Nukari. She grew up in the city, but, from childhood on, her summers were spent at the seaside, in the wilds of nature. There, as a child, she would dig up clay and make models, or on rainy days, draw pictures. There she learnt to observe wildlife, initially taking an interest in everything that moved in nature, insects and snakes as well as hedgehogs and birds. When it came to choosing a career, Pirkko Nukari was torn between sculpture and biology. She went to art school and studied biology at university until sculpture got the better of her. But her biology studies were to stand her in good stead as she strives in her sculpture to be genuinely faithful to reality. She studies her subject in the wild, in books and in museums, making quick sketches from which she then chooses her favourite pose or movement, like a snapshot from the animal's life. This is a long process during which artistic conception is born out of fidelity to real life. 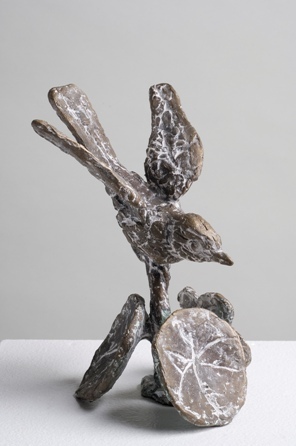 “The starting point for my sculpture is usually direct experience, occurrences repeated a million times over in nature yet at the same time unique, whereby animals fulfil the purpose of their own lives. This gives me the impulse to fulfil my own,” she says. The artist is fascinated by the beauty of birds and their habits in the wild. At times she examines their birth and awakening to life, but she also deals with the end of a bird's life by placing a dead kestrel on a festive table as if on an altar. Sometimes she situates a bird in an urban landscape. Then it is as if the bird has landed amid the buildings on a crumbling stone block, a piece broken off from an old town house that is being pulled down. The world of birds is rich and multi-faceted. The bird is a symbol of freedom, but, as an interpretation of ecological thinking, it also symbolizes the threat of destruction faced by the natural environment. The artist is concerned with all these aspects, and in each sculpture she preserves a memory of the bird just as it is in all its details. She does not, however, see herself as a politically committed artist, but has become, almost unintentionally, a spokesperson in the cause of nature, a sculptor who in her own honest way takes a stand against the dangers besetting it. Pirkko Nukari does not conform to the various contemporary trends in art whereby anything goes in terms of construction and materials. She is a powerful sculptor of bronze who strives for lifelike fidelity, interpreting in her art the rich life of birds in the wild. “Nature in all its manifestations is my muse. Birds are a symbol of my feeling for nature,” she explains.